Happy Friday all. We all made it through another week and now can kick up our heels and relax for the weekend!! Well, we can all try right? 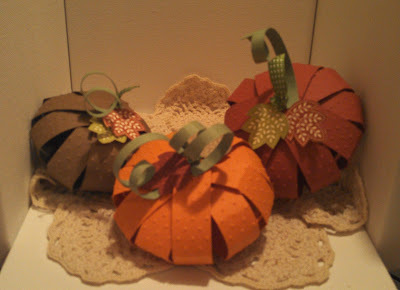 For today's Friday Video i wanted to show you how to make these adorable﻿ 3D Paper Pumpkins!! For the pumpkin you are going to need a piece of card stock cut at 8 1/2" x 5". If you want your pumpkin skin to have texture, run it through your Big Shot. I used the Perfect Polka Dot embossing folder. Cut your card stock into strips 3/4" wide. OMG!!!! Are you serious? 15% off almost every single stamp! That is going to be like Christmas early! So, get your orders around and place them by either contacting me via email or come back here to my site on the 29th and place your order here directly. All orders, if placed by phone or email, should be received to me no later than 6pm on the 29th. With this amazing deal I am sure the SU! order site is going to be packed and we want to make sure to get our orders in!! Well, i hope you enjoyed today's video. Until next time... Happy Inkin'! !